…..It’s that time again. Labor Day is right around the corner, and most of the country is clinging to those last few days of 80+ degree weather (We’ve got a few more months here in Florida). You’ll start to notice the menu’s at your favorite bar changing over to fall seasonals, and warmer selection cocktails and entrees. Labor day is the unofficial end to the good times of Summer, so let’s go out with a bang and cool off one last time with some ice cold cocktails. 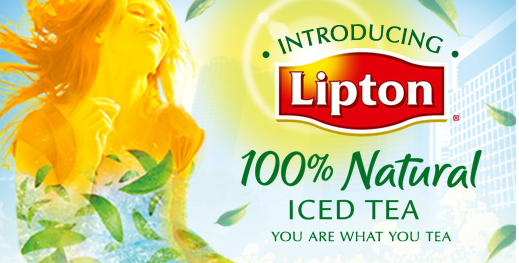 We recently received some samples of Lipton Ice Tea 100% Natural and diet products. What says Summer better than an ice cold pitcher of tea? 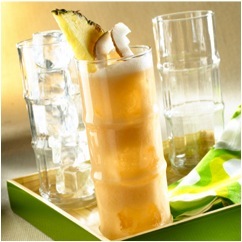 Or better yet an iced tea mixed drink? Tea is one of the most underrated mixers when making drinks, and with Lipton’s new flavors practically begging to be mixed with spirits, Lipton took notice and decided to whip of a few recipes of their own for you and I to try. While certain members of the 101 family aren’t fans of tea or anything tea related (there’s two of us, do the math), I’m an iced tea fanatic and couldn’t wait to give these a try. As a fan of iced tea, one drawback I usually have is how much high fructose corn syrup comes in the pre-packaged varieties. The older I get, the more things like this start to actually bother me, so knowing that Lipton now offers an all natural tea featuring real sugar, no artificial flavors or colors, and lower calories makes it all that more appealing. Their new products range from 50-70 calories, depending on the flavor, and will set you back less then $2, depending on where you’re at. We also received a few Zero calorie diet teas as well. Here’s the run down of what we sampled. 100% Natural Green Tea with Citrus: Made from the finest leaves in the world, with a clean, pure taste, tea flavonoids, and hints of lemon peel and lemon grass for a unique, refreshing, flavor. 100% Natural Iced Tea with Blueberry & Pomegranate: Iced Tea blend of blueberry and pomegranate flavors. 100% Natural Iced Tea with Lemon: Enjoy a 100% twist on a chilled, classic favorite with this tasty combination of smooth black tea and zesty lemon flavor. Diet Green Tea with Watermelon: Refreshing, summer-time taste of watermelon-flavored green tea – without the calories. Diet Green Tea with Citrus: lemon zest and crisp citrus flavors without the calories. Overall: Can’t say enough how much I enjoyed the Natural line. Our My favorite was the Blueberry Pomegranate,which was much more flavorful than I was expecting from a flavored tea. It doesn’t hurt that it’s flavor combinations makes for one hell of a cocktail. The Lemon tea was great as well, but the Citrus tea really blew me away in how refreshingly sweet it was without being over the top and without overloading the sugar/calories in this one. The citrus really makes it almost taste unlike tea at all, which caught me off guard. After tasting the low calorie 100% Natural Green Tea with citrus, tasting it’s 0 calorie alternative fell kind of flat. The Watermelon was another hit though. The idea of mixing watermelon and tea never crossed my mind, but it works great in this case. All in all, Lipton needs to give a high-five to the head of development, because they hit a home-run with these. Thirsty Yet? Try one of these recipes below. 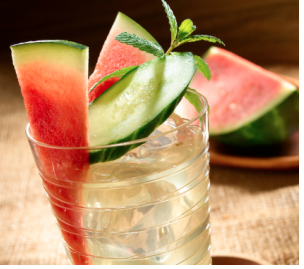 In a pitcher, combine Lipton Natural Diet Green Tea with Watermelon, cup grated cucumber, and vodka . Let stand covered at room temperature 30 minutes; strain and chill until ready to serve. Serve in ice-filled glasses garnished with cucumber slices and fresh mint leaves. 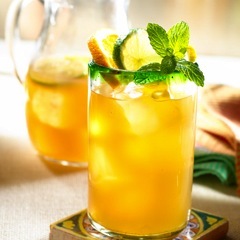 Combine Lipton® 100% Natural Iced Tea with Lemon and lemonade in pitcher. Did you know we’re on Pinterest?!? 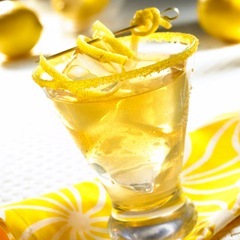 Also Don’t forget to follow us on Twitter, like us on Facebook, or stumble us on StumbleUpon to get our latest cocktail recipes, spirit reviews, and drink related news. Recipes and samples provided courtesy of Lipton.